Spanning four counties, this large wilderness area yields the best experience when hiking the property’s extensive multi-use trail system. Sixty percent of the property is floodplain marsh and together with the hydric hammocks, floodplain swamp, pine flatwoods and wet prairie, you’re apt to see a broad spectrum of species. Be sure to take water and insect repellent, especially in warmer months. Sora, King and Clapper Rails call from the marshes along the St. Johns River and Wood Storks, Sandhill Cranes and Limpkins can be spotted. 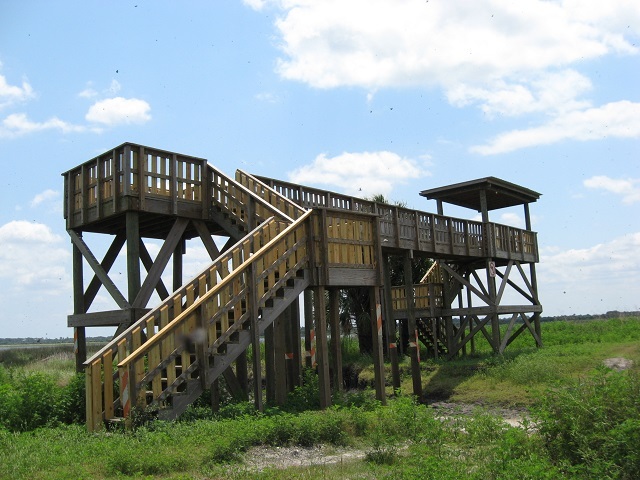 A large observation tower is located on the southwest side of Loughman Lake; park on the east side of Hatbill Rd. and hike southeast for 0.6 mi. Check here for Mottled Duck, and the occasional American Pipit (winter). As you wander, keep your eye on the sky for American Kestrel, Merlin and Northern Harrier; Short-tailed Hawk and Crested Caracara are possible. Hike the hammocks in the early morning looking and listening for Red-eyed Vireo, Black-and-white Warbler and Summer Tanager. There are two additional trail access points on the west side of Hatbill Rd., with map kiosks at each. Butterfly viewing is excellent; 60 species have been recorded! Seasonal hunting takes place on the southwestern portion of this site please click here for dates, regulations and more information.